At the Caritas Christi Center, a ministry of the Apostles of the Sacred Heart of Jesus, we’re dedicated to providing formal and informal opportunities for spiritual growth and faith formation in the Catholic tradition. Caritas Christi Center invites God’s people to deepen their relationship with Jesus through prayer, study, and mutual interaction in order that they might bear witness to His compassionate heart. Center yourself in the “love of the Heart of Christ” at the Caritas Christi Center. A ministry of the Apostles of the Sacred Heart of Jesus, the Caritas Christi Center is located at Mount Sacred Heart, a tranquil setting on one of the highest points in Hamden, Connecticut. Open fields and thickly wooded areas as well as orchards, gardens, shrines, and spacious lawns comprise the beautiful 125-acre New England setting. The Caritas Christi Center is available for days and evenings of recollection, workshops, and days of prayer. 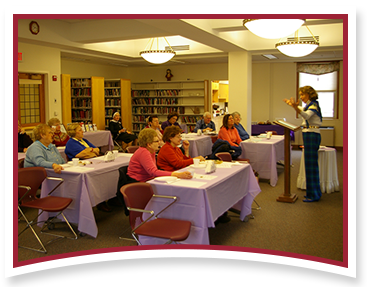 The Caritas Christi Center is available for use on a half-day, full-day, and all-day/evening basis. Please inquire for per-person cost. If your group requires a speaker, please inquire about availability and cost. Food service is available, including drinks, snacks, and meals. The cost will depend on the selection and the size of the group. Groups must provide a certificate of insurance. The center is a non-smoking facility.